. Jie Ge, Emmanuel Normant, James R. Porter, Janid A. Ali, Marlene S. Dembski, Yun Gao, Asimina T. Georges, Louis Grenier, Roger H. Pak, Jon Patterson, Jens R. Sydor, Thomas T. Tibbitts, Jeffrey K. Tong, Julian Adams, and Vito J. Palombella. Design, synthesis and biological evaluation of Hydroquinone derivatives of 17-Amino-17-demethoxygeldanamycin as potent, water-soluble inhibitors of Hsp90. J. Med. Chem. 2006, 49, 4606-4615.
. Hertlein E, Wagner AJ, Jones J, Lin TS, Maddocks KJ, Towns WH 3rd, Goettl VM, Zhang X, Jarjoura D, Raymond CA, West DA, Croce CM, Byrd JC, Johnson AJ. 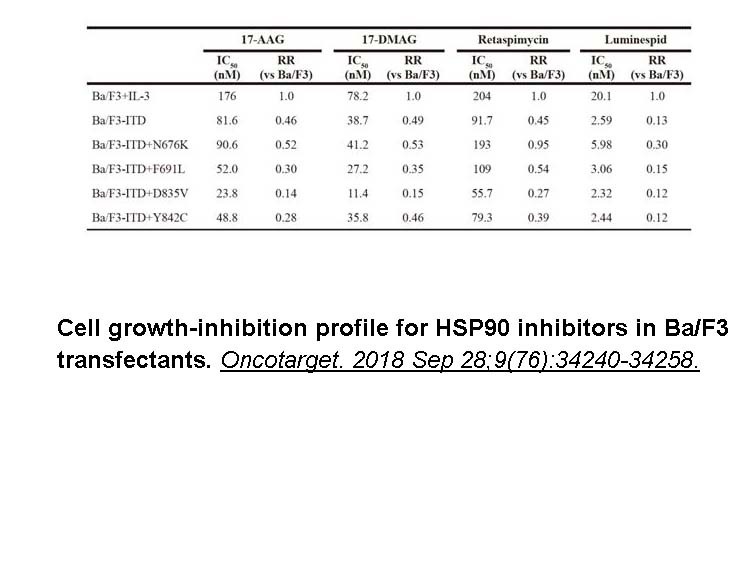 17-DMAG targets the nuclear factor-kappaB family of proteins to induce apoptosis in chronic lymphocytic leukemia: clinical implications of HSP90 inhibition. Blood. 2010 Jul 8;116(1):45-53. Jie Ge, Emmanuel Normant, James R. Porter, Janid A. Ali, Marlene S. Dembski, Yun Gao, Asimina T. Georges, Louis Grenier, Roger H. Pak, Jon Patterson, Jens R. Sydor, Thomas T. Tibbitts, Jeffrey K. Tong, Julian Adams, and Vito J. Palombella. 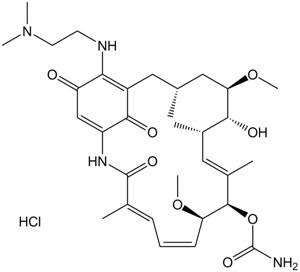 Design, synthesis and biological evaluation of Hydroquinone derivatives of 17-Amino-17-demethoxygeldanamycin as potent, water-soluble inhibitors of Hsp90. J. Med. Chem. 2006, 49, 4606-4615. Xiaoping Sun, Jillian A. Bristol, Satoko Iwahori, Stacy R. Hagemeier, Qiao Meng, Elizabeth A. Barlow, Joyce D. Fingeroth, Vera L. Tarakanova, Robert F. Kalejta, Shannon C. Kenney. Hsp90 Inhibitor 17-DMAG Decreases Expression of Conserved Herpesvirus Protein Kinases and Reduces Virus Production inEpstein-Barr Virus-Infected Cells. Journal of Virology. 2013, 87 (18): 10126–10138. Melinda Hollingshead, Michael Alley, Angelika M. Burger, Suzanne Borgel,Christine Pacula-Cox, Heinz-Herbert Fiebig, Edward A. Sausville. 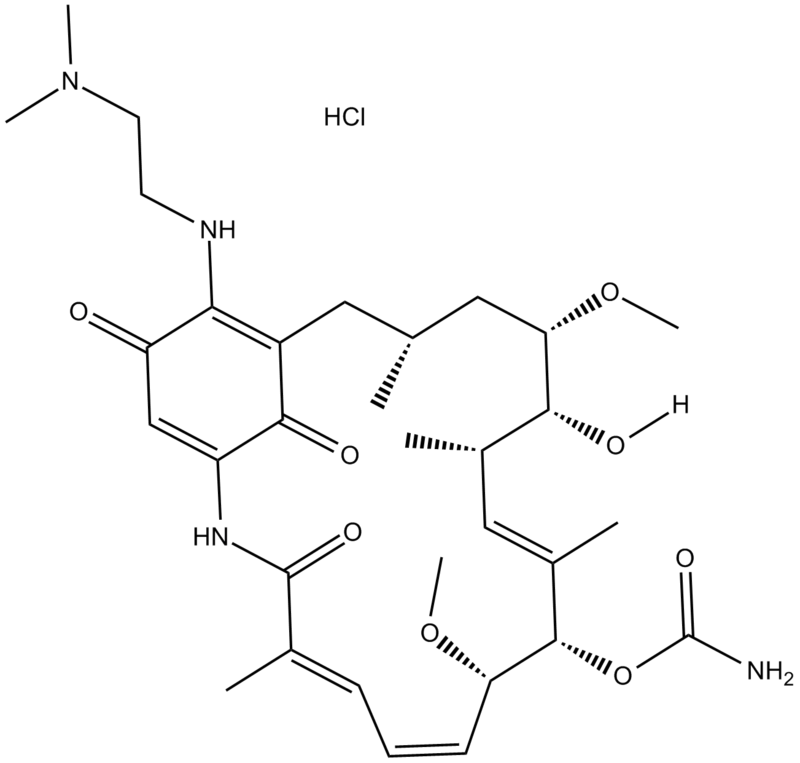 In vivo antitumor ef?cacy of 17-DMAG (17-dimethylaminoethylamino-17-demethoxygeldanamycin hydrochloride), a water-soluble geldanamycin derivative. Cancer Chemother Pharmacol. 2005, 56: 115–125.